Rongitsch Construction specializing in both new construction and remodeling. Established in 1992, Rongitsch Construction is driven by one thing - the customer. With a genuine commitment to providing an extraordinary level of service to its clients, Rongitsch Construction will provide the service you are looking for and deserve. From the first meeting and all the way to the closing, Mike Rongitsch will walk you through the home building process. A hands-on builder, Mike strives to make the building process a stress free and wonderful experience. With the emphasis on quality and not quantity, Mike and his team builds and renovates each home as if he were building it for his own family. 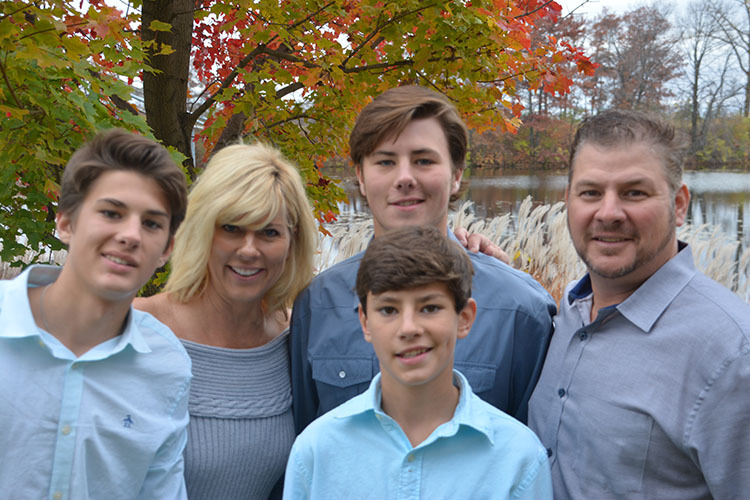 Mike and his wife Desiree live in Lakeville with their three Sons Nate, Jacob and Tommy. Mike grew up in So. St. Paul, MN and the construction industry has always been his passion. Mike enjoys all aspects from the first vision to the final turn key product. He continues to keep up to date in all aspects of design and construction. Using the most current technologies, this combination of attributes make him a very well rounded and educated builder. His eye for design and his passion for homebuilding, drives Mike to refine his versatility as a homebuilder. Mike says the best part of the job is the joy a family gets when he reviles their new lifestyle in a Rongitsch Home. Alexandra grew up in Lakeville, where she resides today with her family. While living in Lakeville she has grown to love the community and everything that it has to offer. Alexandra has her Bachelor’s degree in Business Management, which has helped her in effectively managing Rongitsch Construction. Her passion for the home industry stems from her strong family influence. Her family owned and operated a successful millwork company for 35 years! Alexandra strives to give you the best experience you deserve while working with Rongitsch Construction. She will be with you every step of the way, from the initial meeting to the phenomenal finishing touches. We look forward to helping you achieve Your Dream Home Today! Shelly is an Executive Closer at GCS Title. Shelly migrated from banking to title and realized instantly that she had found her niche in the fast-paced, diverse profession of being a closer. Shelly has years of experience with new construction transactions and insures that her builders and clients feel that they don't need to worry during the process. Her professionalism and experience make her a favorite among the industry. She is committed to provide exceptional customer service and a successful closing transaction every time. One of Shelly Brekke's favorite things about her job as a closer is sharing clients' excitement as they move on to a new chapter with the sale or purchase of a home. Jodi is a proud wife and mother of 2. She lives in Elko with her husband Jeff and children, Adam and Allie. She loves her family and her community. Jodi grew up in Moorhead, MN with two siblings Jayson and Jeni. Her parents, Doug & Jan Perry, taught her the value of hard work and responsibility, which is carried over into her real estate career. She has been in real estate since 1997 when starting in Senior Cooperatives. She believes that every client should be treated like family. Her excitement and dedication to make sure all clients get the most satisfying experience possible when building with Rongitsch construction. Jim Swanson has spent 26 years as a full time realtor, with 14 years of new construction sales experience. During his career he has had extensive design and renovation experience as well, with over 600 units completed and sold in that arena alone. Jim is passionate about houses, construction and people, and is a multi-year judge for the Twin Cities Builder’s Association for the Parade of Homes. A lifelong resident of Minnesota, Jim is licensed in Minnesota and Wisconsin.